My guest this week is Jennifer Priest from the blog, Smart Fun DIY, and the social media marketing firm, Smart Creative Social. 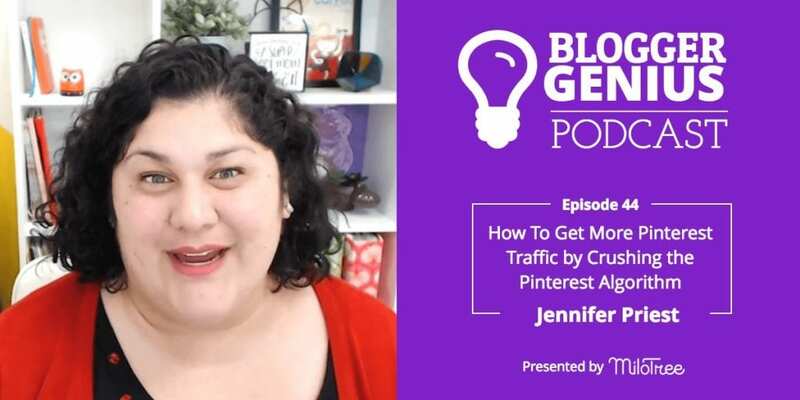 Jennifer shares awesome advice about how to get more Pinterest traffic by crushing the Pinterest algorithm. By putting yourself in Pinterest’s shoes, you can understand what they’re looking for, and how by giving it to them, you will grow your traffic. We talk about optimizing your overall Pinterest strategy, using hashtags on Pinterest, what Pinterest communities are all about, and so much more! If you are trying to grow your Pinterest traffic, this episode is a must-listen! Plus, Jennifer is one smart cookie! Welcome to The Blogger Genius Podcast. Brought to you by MiloTree. Here’s your host, Jillian Leslie. Hello, everyone. Welcome back to The Blogger Genius Podcast. Today I’m really excited to introduce my guest. Her name is Jennifer Priest. And she started 15 years ago in the online space as a DIY blogger. She has been doing that for this long, she’s still doing it. She has a digital marketing consulting firm. So we’re going to talk about both of those sides of her business. So welcome to the show, Jennifer. Thanks so much. I’m really glad to be here. We are trying to figure out when we met, but we have been circling each other. We’ve been at a variety of conferences. We definitely met at Vid Summit last year. We both believe in conferences and like going to conferences. Yeah, oh, my gosh, conferences are like one of my favorite, favorite things to do. I think, you know, one of the things is we work from home alone. And so it’s nice to go and see other people and interact. And it’s nice to put a face to the name. I’ve heard of MiloTree for so many years, and to be able to then go and like meet you in person and talk to you. There’s nothing that can replace that face to face connection. Even if we’re doing Facebook Lives, it’s so different to actually interact with someone in person. So I love just the networking aspect of it. And then there’s also the learning. I so agree, and it’s funny. It’s exactly what you just said. As soon as you meet somebody in real life. It is like that friendship is so solid. Yeah, you feel like you’re like absolutely friends. And you’re like, we literally talked for five minutes. But it’s like, I would trust you with my child. Yeah, I have a friend that we’ve actually been friends online for two years. And a couple years ago, or we were friends online for two years before we met in person. And a couple years ago, we planned this retreat, where like, six of us were bloggers and artists decided to go on this crazy trip to Gatlinburg, Tennessee, and it was really fun. And we met in a restaurant, and then we’re going to carpool from the airport the rest of the way, to the place where are camping, and I was like, this is the first time we’ve actually met in person. And she’s like, no way. And I’m like, Yeah, because we’ve known each other online and through texting for two years. But, you know, that’s one of the great things about doing conferences is you can meet these people in person. Yes. I think it’s kind of what you were talking about. We work alone at home. And there is something to meeting another online entrepreneur that you’re, you have this feeling of like, I understand your world. Yeah, I mean, I don’t know anyone in my town who does anything remotely like what I do. I’d probably have to drive an hour to find someone local, that would even understand. My family, my husband and my kids get it. But like my extended family, they’re just like, you do something on the internet. Right, right. So there is that sense of what it’s like to sit at your computer in your pajamas, you know, working on something that needs to get done for tomorrow. Yep. Yep. Or getting up at five in the morning. Because you’re like my blog post due today. I didn’t finish it. Yes. I think there is that kindred spirit element to when you meet somebody in real life. And you can say, hey, let’s talk SEO. And you both know exactly what that means. That and I think too, when you meet in person, the guard comes down. So we were talking earlier that we had we had been to the Adthrive Conference together. And while we were there, a blogger that I have known online for years, I have seen her conferences, but we never really talked, we had a mutual friend. And so the three of us, we went out kind of adventuring in Austin. And it was the most fun tim. We started talking about family and our lives, and I feel so connected to her. And it’s like you, you can’t replicate that. It’s the commonality that we have that kind of breaks down the barriers, and then the conference gives us that opportunity to get those deeper connections. That’s not even about blogging anymore. Right. It’s why I say, I trust people, I would trust you with my child. You know, it’s weird. And there is an intimacy to it. Let’s hear your story. Because I don’t know it. So it starts quite a long time ago. I’ve always been entrepreneurial, like when I was nine years old, I had my first craft fair, selling earrings. I’ve always been crafty, always been entrepreneurial, always kind of a busybody. I used to organize the kids in the neighborhood to like, gather cans and bottles to recycle. And then we would amass the money together and go buy candy and stuff. I was always an organizing kind of person. And so when I had my daughter, I started doing scrapbooking. And I got a mail order kit. And I got really into it. And I started teaching classes. And I joined a direct sales company. And the direct sales company kind of came at the time that I had just graduated from college, and two bachelor’s degrees, and I could not find a job because the economy was really bad. So I joined this direct selling company and I worked my way up the ranks. And within six months, I was like the number two consultant in California. Now wait, what is a direct selling company? So it’s like, Stampin’ Up or Tupperware it’s multi level marketing where you order from catalogs, you do parties in people’s homes and that kind of thing. And so that was kind of my entry into it. I started doing email marketing to promote that. So previous to that, my online experience was to get through college, I used to sell like my daughter’s baby clothes. And I would go and buy things and sell them on eBay for a markup. So we’d go to like estate sales or yard sales and find something really expensive, and buy it for a good price, and then resell it. And that’s a lot of how I got through college was was doing my eBay business. So then I was doing this online thing with email marketing, because I was like, I don’t know how to build a website. And so I did. I built that online business with email. And I was teaching in scrapbook stores. And meanwhile, I ended up getting a job working for the local county. And I was doing grant writing, a mix of grant writing and contract management. Working with all of these different contractors who provided substance abuse services for the county. I ended up losing my job, they’re very crooked. And the day that they fired me was when they’re being investigated bya grand jury and I was turning over records and they’re like, No, you’re gone. Yeah. Very shady. So I was devastated because I was going to school to get my masters. And I thought that I would work in government for a long time. I tried to go to class because I was getting my masters. I tried to go to class my professors, like you’re a mess, you need to go and so I went to the scrapbook store, because that’s where my friends all hung out. And I had I had kind of taken a moratorium from teaching because I was commuting really, really far. I go in the scrapbook store. And I’m like all teary eyed because I lost my job and wounded my pride and stuff. And they’re like, good, you can now teach classes here more often. And I was like, seriously? And so my husband, he end up getting a promotion the next week, and because I was making a lot of money doing what I was doing and, you know, his promotion didn’t equal to what we were making before. But He’s like, you know what, stay home, do your thing, go work this business, I know you’re really passionate about it. And so that’s what started it all. And that was back in like 2005. So I started teaching at all these different scrapbook stores and still doing some different direct selling companies, and making kits and selling them and making things on eBay and selling them. And I had clients in like Japan, and they were just order stuff over and over and over. And then as at this one store in 2007, that was a pretty big scrapbook store in Southern California. And telling people about my classes in my emails. And they were like, you know, we really would love to be able to share this stuff, can you put put it on a blog, share your classes on a blog, and then we can tell our friends. Or, why aren’t you on Facebook? I was a technophobe. And I was like, I don’t need all that I don’t need a cell phone. I didn’t have a cell phone forever. I didn’t have texting forever. But if I needed it for my business, I learned it. And so I was like, Okay, I’m going to get on Facebook. And so my intention with Facebook from day one was a business thing. And my intention with the blog from day one was to promote my offline business, which was sell these craft kits. Are those craft kits you were putting together, or was this these companies? I was putting them together. So at that point, I had transitioned over to ordering the supplies wholesale, you know, going down to the garment district in LA and sourcing all these like, really unique things, making some of the supplies like die cutting paper and, and sewing little applications and stuff like that. And I would put these kits together in mass, and not only teach my classes with them, but then I would sell them on Etsy. And so in 2007 is when I learned about Etsy, and I was like, Oh, my gosh, this is like eBay handmade. For me, that was my reference point. And so I also started promoting my Etsy business in my emails and on Facebook. And where are you collecting these emails? I was using Constant Contact. So I had a paper notebook that people would fill out. When you were teaching, you said, Here, give me your email address? Yeah, I would have them fill out this paper notebook while I was teaching or like, if I did a booth at a craft fair, or scrapbook expo or whatever, I would have this little thing, you could sign up on my email list. And then I actually started making those and selling them to other people. And I would decorate it for their businesses. And I would sell like the printable. I’d be like, oh, I’ll make it custom for your business. I was doing all kinds of crazy stuff. And so I had a paper book. And I remember this one time as using Constant Contact at that time, because they were the gold standard. So anytime Constant Contact was like, hey, do you actually have that this person signed up and, and they’re like, we’re getting a few spam reports. And so I sent them photos of my book, the pages we used to have to do that. I mean, can you believe that we used to have to keep a paper record that they gave us their email address. And so everything kind of evolved. In my circles, I started becoming the go-to person for blogging and social media advice, because I was using it for my business. In 2009, I booked my first corporate client, and so somebody where I manage their social media and for their company, and posted the things and manage their design team, and just did all of that stuff in the craft industry. And so from there, I’ve gained more and more knowledge because I’m learning it for my business anyway. I gained more clients and then workin in social media on different client accounts, really eye opening to see like, how different things can be, you know, between a multimillion dollar company and my small little blog, but also to see the commonalities in there. And the challenges that they still face, like money is not the answer to everything. And it’s given me a lot of really interesting insights into how to work social media. Yeah, so to break it down as far as the commonalities, that’s like more than a podcast. But I think one of the things is the methodology that you have to use, and looking at things that’s the same. So you kind of have to approach it from more of a scientific mindset, where you’re looking at the evidence, looking at the data, really analyzing it doing, you know, some level of creativity, so you’ve got to have both sides of your brain working. So you look at, you look at the data, and you’re really good with analytics. But if you you can’t think of creative ways to then get to your goal, you’re not going to be successful. So I do a lot of studying the numbers, looking at what the platform is telling us based on how does our content behave, what happens to it when we post something on Facebook? And then what happens after that point. But also looking at stuff like the signals that they’re saying in the news, what their press room says, what is on their blog, what is Pinterest posting on their engineering blog,on Medium that gives us signals as to where they’re going, and how the algorithm is performing. And then I can take that information and also be some of my experience and the trends and say, Okay, this kind of content is going to perform well. If we put the content out in this manner, based on all this evidence, I think it’s going to perform well. And so every piece of content that we put out on social is an experiment we’re trying to see, like, okay, I’ve hit check on these boxes that I think are going to make it work now. Let’s see how it performs, and then go back and reanalyze it. And so it’s this continuous process of analysis and testing, analysis and testing. And I think that’s where a lot of people get in trouble. Wwe go to a conference, or we take a course, and we’re like, awesome, this person gave me a checklist of all the stuff I gotta do. Rainbows and unicorns are going to shoot out of the sky, I go home, I put it in place, everything’s amazing. And then tomorrow, the algorithm changes. And that stuff doesn’t work. Because those are tactics, those are steps, those are tasks. And we’re not learning how to think about the platform. And so that’s the major thing that I’ve learned through all of this is just thinking about the platform and realizing the algorithms are here to stay, because there’s just a fire hose of information. And they have to be there in order to give us a good experience on the platform. I mean, if I saw everything that my family members were posting on Facebook, I would just delete it, delete it, because it’s just too much. And so the algorithms have to be there. So we got to accept that they’re there. But then the second thing is what are the algorithms there to do? They’re studying our behavior, and then making rules that help them get the outcome that they want. So we can do the same thing. If we study the platform’s behavior, we can make rules to get us the outcome we want. I think that is so powerful. In fact, the thing that I always say is, so Pinterest is very valuable for Catch My Party. It drives a ton of traffic. And I say, when Pinterest says something, I pay attention. If they tell me, okay, we don’t want these long pins anymore. And this is like, they come out and they say, 600 by 900, it doesn’t matter if I don’t like that. I’m not going to second guess what they say. I’m not gonna go well, my long pins have worked so well. I know they’re saying this, but I’m not gonna listen to it. Oh, my God, I’m going to be the first one listening to it. Yeah, when you think of these companies, they don’t do things flippantly. And there’s this huge machine behind them that then it’s almost like, I think of like, a big alligator. Like, they don’t move that fast. They’re kind of or a dinosaur moving so slow. And so everything they do is very deliberate. And there’s meetings after meetings and focus groups. Yeah. And they’re not making those announcements, because they just decided we’re going to make it hard for bloggers. But that is that is the thinking that is pervasive in many Facebook groups with bloggers, is this idea of the platforms are just out to get us. They don’t care. They just that is not their purpose. Like every single platform that’s out there. And I feel like Pinterest is so good about being transparent about this, they have a mission. Pinterest’s mission is to help people discover new ideas and go out into the world and try them. And so that’s at the heart of everything that they’re doing. So if they’re saying that this needs to be a two to three ratio pin, we can go and say, Okay, why is it that they’re saying that because 80% of their users are on mobile, and they look better on mobile? Have you tried to look at a giraffe pin on mobile, you can’t see it. And so if that is what they think is going to help them get back to their mission to help people discover new ideas. Awesome. I’m going to help people discover my new ideas on their phone. And so I think that the thing is, kind of a little bit of a mindset shift in how we think about these platforms. They are not out to get us, they absolutely know they need content creators to be on there putting stuff on there, whether it’s Facebook, or Pinterest, or YouTube or whatever, but they have a mission. And so if we accept that, and we stopped fighting it, and just take the signals that they’re giving us and and then adjust our strategy to those signals. First, we can have an ever evolving strategy. So that saves us a lot of grief. But second, we’re going to have more success, because we’re not wasting time. I hate to kind of sound like I’m on a soapbox, but we’re not wasting time with stuff that doesn’t make any sense. And that is somewhat a level of immature thinking in our business to think that a platform is going to care about a blogger, even a 5 million views a month blogger to say, I’m going to make this change and platform to make that blogger’s life hard. Yes. And again, you have to think that these platforms need to monetize, these are businesses. So you have to put yourself in the mindset of Pinterest, or Facebook or Instagram, and they’re trying to give the best experience they possibly can to their visitors. And they’re all still free. They’re not charging us and people say well, it’s just pay to play. There are always outliers, always people on the fringes that are all of a sudden they’re going viral, because they’re doing something that captures people’s attention. They’re doing something that works within the algorithm. And sometimes people don’t have a plan. They just have some kind of magic touch. But really, a lot of the people have a plan. Like if you look at these guys, the Sharer Brothers they are two college brothers, they decided we’re going to start a YouTube channel. They’re very methodical and how they did it. They started in January of 2017. By October of that year, they had over a million subscribers. You can totally work the system to your favor. And I think it takes a mindset shift of instead of seeing a difficulty, a roadblock, first looking at it as a challenge. But then looking at it as an opportunity. Would you say that Pinterest is where you focus your time or where you are the biggest expert? So you know, one of the things that’s been a challenge, I had this discussion with Michael Stelzer from Social Media Examiner. And this is something that I’m going to share the story because it’s a little bit embarrassing, but it’s also something that we need to think about in our businesses, especially as a lifestyle blogger. You asked me what kind of blog I’m like I say, DIY, because I’m doing stuff. We’re kind of all over the place, right? Where I do recipes, I, I fixed my house, I make crafts, it’s hard to communicate. I travel, Disney, Mexican food, there’s a lot of stuff in there, right? And so we’re trying to be all things to all people. And so I was talking to Michael Stelzer because he was like, Hey, you’ve kind of been on my radar for a while, but I didn’t understand what you do. And that was such like a heartbreaking but also revealing moment, because you can’t be all things to all people. And so I think for us, when we’re talking to people about what we do, if we can communicate like one thing that we’re really solid on and that could be like our entry point. And so I say, I’m DIY craft because that’s something I’m really solid on. And that’s an entry point into my craft blog. But I have recipes on there, too. And so as like the Pinterest thing, I’m really solid on Pinterest. I have a course on Pinterest that makes sense for people to understand and know. But it’s not the only thing I do. I have a YouTube channel. I’ve had virals on Instagram. This year, I doubled the size of an Instagram account within a couple months and hit well over the 10,000 mark with it. So I can do stuff on lots of social media platforms. But I needed something that made sense for people to understand that, okay, she gets Pinterest. That’s something bloggers need. That’s something that businesses need to get traffic. And so that’s like my entry point. But it’s not the only thing. And so something for any of us that are like lifestyle bloggers to think about is like, what is our entry point that we can get people in and then they can learn all this other stuff. Because if we just say, I can do everything at the beginning, there’s nothing for people to attach to. And they don’t understand. I get that. When I was at Mom 2.0 this last year, I went to an Instagram talk and I forgot who was leading it but she said this that I thought was really powerful, which you’ll relate to. She said “lifestyle” on Instagram is not a niche. On Instagram you want to niche down and just how you said you know, Pinterest is kind of your way in, like if you are lifestyle blogger, pick your lane and really dig deep in that lane. Maybe you do more food than travel, or you like food better than travel, or like travel better. Go so that somebody can see you and go oh, travel well then you can add some food and stuff, but you do want to in the world of the internet, it’s so easy to get lost. And so do think where could I… where’s my comfort place? Where is my sweet spot? Yeah, and I think you know, the idea to of having this one branded Instagram I mean I’m up against this too, I have a Smart Fun DIYs Instagram it is slow is slow growing. And I know why that is. It’s because you look at it,and you’re like I don’t know what this is about, and people in less than a fraction of a second are making that decision and assessment where I have other accounts that are niched way down, and those are growing crazy. Like in the same time period of three months on Instagram, Smart Fun DIY, this summer grew 1000 followers, it has 29.1000 followers. So not a lot bigger thousand in the same time period, I grew a niche to count from 7000 to 13,000. It’s going to be more than Smart Fun DIY before the end of the year. And it’s because people look at it, they get it they’re either in or they’re out. They don’t have to think hard. Their lazy lizard brain is like, I get it, I want it, I don’t want it. And then they’re in or they’re out. There’s nothing that says and this is something I’m experimenting with. And I know other bloggers have experimented with this too. There’s nothing that says that you can’t take that and create other niche accounts. So if I am doing let’s say, food crafts and Disney and I have three different niche accounts that in interact with my lifestyle branded account, and I’m putting that content out in multiple places. Now, again, this is more of an Instagram thing. But why can’t you do that. And if you think of Pinterest, we have boards for different sub topics, you could treat Instagram like your boards to and have different sub topics. Now you need to be maintaining those. So there’s a question of scale. You can’t do it on 84 topics. But it’s something to think about of how do I get people in the door and then I get them to follow my main account just like I’m using Pinterest to get people in the door. But I do all kinds of other stuff for companies. Right. And I would say for Catch My Party, guess what if you go to our Instagram account, we’re going to show you beautiful dessert table after beautiful dessert table and and we have over 150,000 followers. But you like it or you don’t. It makes sense to people. They have to understand it. You know Walmart’s confusing, it’s big and huge. You don’t know what they do. You go into Pier One. You’re like decor. I got it. Yes. And by the way, I get overwhelmed at Walmart. Right, Costco, the same thing. It like hurts me a little bit. Like, I have to figure out how to get my cereal and my motor oil. Like it’s too much. I go to Target. And I only shop in one side of the store. I’m like, I’ll shop in the grocery side for groceries. And then I’ll make another trip to go get candles and notebooks and like, it’ll probably be a different trip to get clothes. Because it’s too much. As a blogger myself, I know that there is a lot asked of us. And sometimes it’s too much. If you’re trying to grow your traffic, then you definitely need to grow your Pinterest followers. There’s a direct connection to active, engaged Pinterest followers and growth in traffic. Because those are the people who are going to interact with your early pins and Pinterest is going to show it to a larger audience. If you have not tried MiloTree head on over because we will help you effortlessly grow your followers. In fact, if you have a friend who’s using MiloTree asked them what they think. The best way we’ve grown, our business is through word of mouth. And also if you sign up, you get your first 30 days free. You get added to my newsletter. I send weekly emails, sharing actual tactical tips, but also some ways to think about your business and manage the different things that we struggle with as entrepreneurs. So again, head on over to MiloTree.com, sign up, install it on your site. If you have any difficulty. Reach out to me at Jillian@MiloTree.com. And now back to the show. What are Pinterest communities and what are they for? So while we’re talking about Pinterest. Right before we recorded, so this is October 5, when we’re recording this. And two things I want to talk about with regards to Pinterest. One is hashtags and one is communities which have just launched on Pinterest. You have a Facebook group which I saw you talking in. And what is your Facebook group called? It’s called Smart Creative Social Community. So not very original name. Definitely join her Facebook group. Because I saw you in there. And you were talking about communities. And I was like, oh, and then you are going to be on the podcast. I was really psyched about that. So, definitely join the Facebook group. Secondly, let’s talk about hashtags and communities. Yeah, so you’ve got to date it. Because like everything we know about social media today is a snapshot in time, and it could change tomorrow. So that is the challenge, right? So first, let’s talk about communities. Communities are relatively new. They talked about them, Pinterest did like this kind of a town hall conference where they invited people up to their headquarters this summer and told them about all these things. And communities was one of those things. And luckily for us that didn’t get to go. There were people who went who came back and share that information like, Alisa Meredith and Kate Ahl. They shared a lot of that information, which is really nice. And so communities was one of those things. So we knew it was coming. We knew it was in beta testing, you could email and ask Pinterest to start a community. So now they’ve turned it on, essentially. And so the gist of it is, it’s like if a Facebook group where you can talk and chit chat had a baby with a group board on Pinterest, it will be community. So you can stick pins in there. They don’t want it to be self promotional. They don’t want it to be like a group board where, you know, I feel like bloggers come in and they break things. So it’s like, Hey, we started this new, beautiful thing called a group board. You can collaborate and their intention is something like my group board called Dream House, where my husband and I and my daughter are putting stuff on there that were like, Oh, I like this. And bloggers were like, Hey, we can game the system. We’re going to put 800 bloggers on here. We’re just going to slam it with all our stuff. And we’re gonna get it like a ton of traffic. And so Pinterest was like, Whoa, whoa, whoa, whoa, we wanted this like, collaborative thing, like, what’s going on here. And not that bloggers are bad for breaking it, I think it’s really good to push the boundaries of what something can do. Because Pinterest answer to that is, oh, we still want this mission, we still have this thing that we want to do, we need to put that in a different package. And so they didn’t take group boards away, which is nice. So they’ve got communities, and communities, they’re like, we don’t want self promotion, we want this to be a place where you can discuss things, where you can share things, where you can connect with one another over the Pinterest platform over those visual search results within the Pinterest platform. And so if you think about it as something the way you’re going to manage it should be a lot like a Facebook group. You need to nurture it, you need to curate the people that you’re inviting to it, you need to go in there every day and check. I started a community. I’ve been in there once in like three days. So I definitely need to make sure to make it a priority. I wouldn’t start a community just because you’re like, I want to snag the name or I want to snag that topic. I wouldn’t start a community for that reason. So I started a MiloTree Mastermind Community, and I kind of don’t know what to do with it. Yeah, so you can start discussions in there, you can ask them questions, you can share information, you can pin posts, which is basically like a sticky note, you can sticky note the post so it stays at the top. So like, I made some guidelines for my community and, and put those at the top. So yeah, you can put pins in there, etc. But it’s still pretty unclear. It’s still pretty new. And I I’ve heard some people being kind of skeptical of like, well, we don’t know if they’re going to still have communities, and there’s glitches and I don’t know if it’s useful, so I’m not going to be on it. And I think that’s fine if people want to do that. But I think they’re missing the boat. Yeah. And if you learn early on, you can navigate it. And as they add new buttons and new things, and you’re learning it incrementally as it as it evolves, instead of it being this really complicated thing. So the other thing is people that are skeptical, going, like, Oh, this is a dumb move, and they should have made more research. Like I said before, it’s this big, slow animal. And Pinterest has a reputation for doing things really slow compared to all the other social platforms. You know, Facebook’s motto is like, let’s break stuff. Like, that’s literally their motto. And Pinterest is like, we want everyone have a good time. And so they’re just going really slow and they’re very like methodical, and really intentional with everything they do. So if they think this is a good thing to do, it is worth paying attention to, because they didn’t make that decision lightly. And it is an extremely expensive decision to make, it cost them a lot of money to do it. What would you recommend for somebody like, let’s say me, so I heard about it. I went on, I created my MiloTree Mastermind. I also have a MiloTree Mastermind Facebook group, anybody out there wants to join, please find it. And you know, and sign up. And so what would you say, now? I’ve got now I go, Oh, God, headache. I now have to have two groups that I have to manage. So what would you say to somebody like me or somebody out there. I would not start a community until you are ready to put the time in to nurture and grow it. I would just go and be in other people’s communities and talk to them because you don’t want people to join your community and have it be a ghost town. That same with the Facebook group. Okay. So people don’t join my Pinterest community until I’m ready. Or get a couple people who are active in your current Facebook group. If you have a thriving Facebook group, ask a couple people who are active in there and say, Look, I’ve got this community, would you guys like to come over and kind of help me keep it going. I don’t have the time to be in there every day. But I would love for you guys to be like moderator types. And I don’t know if that’s a setting or if that’s if that’s something that would be coming, but but engage those other people to come over and help them bring their energy to your community. If it’s something that you’re like, I want to grow it. But literally, the holidays are coming up. I cannot do this. So that it’s there. But you know, and know that if it’s there, and you’re not using it that it may be I don’t know, it may be removed, it may just sit there and die. But I think at a minimum joining other people’s communities and being active in it is a good idea. Even if you’re like, I’m not sure I need one. Go be familiar with it. And get active with it. Yes. Get your feet wet. See what people are doing and copy best practices. Yeah. And I mean, sometimes something someone else is doing will spark an idea for you. That’s totally different, which is awesome. So go try that. There’s no, there’s no real rules right now, other than the one thing that I would say to do is Pinterest has community guidelines, which has nothing to do with communities. It’s the same word. These are guidelines for overall Pinterest. Rather, they want you to do things. So just google Pinterest community guidelines, and they tell you what to do, what not to do to be authentic. Don’t spam don’t incentivize people to like, you know, artificially boost your numbers, blah, blah, blah. So read those. And they just kind of keep that in the back of your mind as you are doing things in your community to make sure that it fits in with what Pinterest wants on their platform as a whole. Got it. Great. I think that’s all great advice. And we’ll keep kind of checking in to see what happens if people have great ideas about their own communities. Please email me Jillian@MiloTree.com. I’d love to hear what you’re doing. So that I can get Jennifer back on the podcast. And we can talk about it. Yeah, yeah, that would be really fun. And just kind of leads into the hashtag thing. Yeah, so last year, hashtags. Hashtags, just had their one year birthday on Pinterest. And recently, last year, Pinterest, turned on hashtags. And again, the naysayers were like, Oh, that’s dumb, it doesn’t work. No one’s going to use those. And again, it’s like for them to be able to turn that on, they had to pay a lot of developers to do it, they had to do a lot of research. And it makes sense, if we look at hashtags overall. And I’ve kind of become somewhat of an expert on hashtags. I also have a course on hashtags. It was just serendipity that I had this membership, where I provided research, hashtags, lists, hashtag lists to people last summer. And they were like, I was giving them these lists, and then realizing they don’t know what to do with them. So I was making a course and then Pinterest turned hashtags on. And so I had this captive audience that was like, hungry for hashtag info. And I was like, Okay, you guys, let’s test it. And they were so awesome, because they all jumped in and started testing. And we found out a lot of really awesome stuff about hashtags. Now, first, when you were creating this course, and sending people list of hashtags, was it all for Instagram? It was. The list of hashtags were Instagram focused. And then I realized people didn’t know how to use hashtags. The basis of hashtags really, is it’s a tool to index content yet, if you remember, back when we had books like encyclopedia you would have an index at the back end, then you would say, okay, the banana shows on page 17, 21 and 842. And really, that’s what hashtags are for. Hashtags are a way to index that content. So you put hashtag banana on something on a platform, you click the hashtag, and that thing shows up for people looking for that topic. That functionality is the same everywhere, from Instagram, to Twitter, to YouTube, to everywhere, that has hash tags, and that’s the thing, Pinterest turned hashtags on last year, LinkedIn turned hashtags on two years ago, YouTube very silently rolled out hashtag functionality, there is a reason that these platforms feel that they need to make content easier for people to find. And so not just this move by Pinterest as a signal that, hey, they’ve invested a lot of time, money thinking, mental power, etc, to figure out if they should do this, but that all these platforms are doing it. Musically has hashtags now. So there’s all these apps and platforms that are that are putting hashtag functionality in place. So and Instagram was stories. I mean, it’s just, it’s just all over the place that we can use them. So it was like, okay, Pinterest, how do we use hashtags on there, because it is different than how we use them on Instagram. And so my first thought, like, we’re trying to do hashtag searches and stuff, and it wasn’t chronological. Now, hashtag searches on Pinterest are chronological, these still are missing things. So I would think of it a lot like in that way, a lot like Instagram, you search for the hashtags, you’re not going to see everything in the results. That’s for that hashtag. But you’re going to see the vast majority of stuff show up chronologically in real time. So that’s the same as if you search the hashtag on Pinterest. But where it gets really interesting, and where I feel like the power of hashtags is, and I have a free guide on how to do this on my site, you just get to a right from the front page of site. I’ll add it in the show notes. Yeah, so the real power is in keywords. So making hashtags out of your keywords, not thinking about, okay, I’m putting this hashtag on here, because somebody is literally going to type in hashtag cauliflower recipe. I’m putting this hashtag because I want my cauliflower recipe to show up in searches for cauliflower recipe, not as a hashtag. Yeah, it’s a little complicated. So if you take a keyword and turn it into a hashtag that is like an additional signal to Pinterest about the topic of your content. So if I want my content to show up for searches for like buffalo cauliflower recipe, I’m going to put those keywords in the description. I’m going to put those in the title of the blog posts, etc. And also a new thing on Pinterest this month is you can edit the titles of your pins, so that it’s different from the metadata on your site. So I could split test different titles with different keywords. Like there’s some cool stuff. Yeah. So let’s say that I’m giving all those signals to Pinterest what the content is about, but the hashtag seems to be like a jab, like a like a double whammy of, Hey, if you don’t know that, this is about buffalo cauliflower. Here’s hashtag buffalo cauliflower, hashtag cauliflower recipe, like putting those hashtags on. There’s like this extra punch that really make sure that Pinterest knows it’s about that content. So no one out there is searching for hashtag buffalo cauliflower recipe, they are searching for buffalo cauliflower, cauliflower recipe, easy cauliflower, vegetarian cauliflower recipe, they’re searching for those things. And so the hashtag is a way that that keyword, very specific the hashtag is a way to make sure that that content shows up in Pinterest, search for the keyword. And when you talk to normal people, like Pinterest says, and I’ve heard them say this at multiple conferences. They’re like, use broad hashtags. So in that case of the buffalo cauliflower, Pinterest would say use hashtag recipe, use hashtag cauliflower, which cauliflower is probably a little more specific than they would go, and that will get you if people are searching hashtags. And they’re searching these very basic ones that’ll get you in the chronological search for that. But if that recipe showed up in a search for #recipe alongside a blueberry pie, who knows what they’re looking for. So there’s that. But there’s also that every single non marketer, non online business person that I talked to, doesn’t even know how to use hashtags. They think it’s a joke that you say, like, hashtag funny or whatever. And they don’t notice they’re on Pinterest. And they’re definitely not searching for them. They’re searching for best sangria recipe. So that’s how we were doing hashtags back in the beginning. With my group is we were like, less hashtag keywords. Let’s try different things. And we found that when you put the keyword as a hashtag, it shows up higher in the search. Now, I don’t have any numbers that say it shows up higher in the search other than evidence that’s somewhat anecdotal. Like I put my keywords as hashtags on a sponsored blog post two weeks before Thanksgiving. And it was about Thanksgiving, so it should have bombed and it went viral. There’s those stories that we have for that, but there’s nothing that I have that says, Like, if you put hashtags in your pin, it’s going to show up 20% higher in the search. I don’t have that kind of data, and my brain starts to hurt when I think about doing that. I’m more from the angle of try it, test it, refine it, test it again. So would you then recommend the broad hashtag, if I’m doing let’s say buffalo cauliflower recipe? Would I do a hashtag of recipe like Pinterest says, would I do cauliflower? Would I do cauliflower recipe? Would I do buffalo cauliflower, hashtag buffalo cauliflower. Like, how would you parse it out? I would brainstorm and also search on Pinterest, all of those things. First, I look at the keywords and then I would brainstorm my hashtags. And so those will be usually be about 30 hashtags or so. I only want to put like five or six on a post. I mean, if I’m being like, really aggressive, I’ll put more but you want to avoid the appearance of keyword stuffing. It’s very easy to do. But there have been some indications from people whose accounts have been suspended. Now Pinterest hasn’t come out and made it a formal announcement about any of this, but there has been some indication that there was a level of keyword stuffing with hashtags and to where you know, it’s like 30 hashtags of like cauliflower, buffalo cauliflower, cauliflower buffalo, they don’t want that kind of thing. I would take like the 30 that I have and then split them up and maybe sets of five, so I might have hashtag buffalo cauliflower, hashtag recipe, hashtag vegetarian, hashtag Quito, as the hashtags on one post, and then the next post might be slightly different hashtags. Got it? So I’m still hitting all those hashtags. Yet, I’m not doing it in a spammy way. Yep. Yep. And again, think about it from Pinterest’s point of view, which is they want the user experience to be good. They want those hashtags to help inform the searcher not annoy the searcher. Yeah. And I mean, if we look at the hashtags, we are putting the hashtag to help people who are looking for that content. Discover it. Yeah, that is straight up all we’re trying to do. What is a fresh pin strategy? And so there’s another strategy that I use, I call it my fresh pin strategy, okay. And so this is where I have more than one pin for post. That’s how I’m able to take that block of 30, sometimes at 50 hashtags, and I am rearranging them and putting them on lots and lots and lots of different pins, and then putting them out over the course of time over the course of the year, usually, to see how they perform. And I’ve been doing this strategy since February. And again, I say, pay attention to those signals that the platform tells you Pinterest engineering blog, well, it will make you go cross eyed, because you’re like, Oh, my gosh, they’re talking about UX and UI. And also, I don’t know what all this stuff is. It gives you all these amazing signals about what the heck they are doing. Back in February, they started talking about a new AI, artificial intelligence they were using to read images into read posts, and help Pinterest generate fresh content based on like, the other content you’ve looked at, etc. And so this topic of fresh has come up multiple times when I’ve seen Pinterest talking on Facebook Lives or at conferences, or in some of their announcements and documentation. And I think it’s coming from there was a while there on Pinterest, where you would go and your home feed would have the same pins and data over and over there were the same like most popular pins, but you’re like, dude, I’ve already seen that cleaning hack like six times, your house is clean. So yes, yeah, we were annoyed. And so I think this is a response to that. Because now when you go to your feed, it is different every single time. And vastly different. I’ll be like, wait, I saw that pin I wanted to pick and I didn’t pin it like, you know. And so it’s like, it’s vastly different. And so how can we capitalize on that? Because we have the same old content four years ago, that still amazing good content? I’ve updated it. I’ve done all this stuff. How can I keep that going? Well, you need fresh content. So fresh is new. But fresh, could also be maybe new graphics, maybe new descriptions, maybe new hashtags. Are you then putting these new images in the post, or you separately uploading them? Let’s say you do a post on January 20. And then, like you’ve created some images, and you post one image, let’s say in January, and then you wait two months, and then you’re going to post another image. But is that image already living in the post? Are you adding it separately? No. So what we’re doing is we’re taking what we think is going to be the best performer and we’re putting that at the bottom of the post. And then we’re putting the rest of the pins out through Tailwind or through Pinterest. And then through Tailwind, because there’s a little bit of a strategy there. And then I’m putting them out at a different frequency. But you are uploading them directly to either Tailwind or Pinterest? Yeah, yeah. And then we do split testing and paying attention to how is this performing because of something rises to the top, that will now become the image on my blog post, because of this one image is driving more traffic, I want other people pinning that too. So you’re going to put that at the bottom. Yes, And I don’t do this for like, every single post. I’m not watching 500 posts, and going Oh, ok. post 499, we got to change the pin. I’m just looking at the cream of the crop at the top. Great. Yep, yep. And again, remember, like the 80/20 rule, which is this idea that you can chop up things in terms of it usually takes 20% of the effort to go 80% of the way. And then it takes the last 80% of the effort to do that last 20%. But it works in all these different scenarios. So most of your traffic, 80% of your traffic is coming from, say, 20% of your pins, or 20% of your blog posts. So you want to take the cream of the crop and you want to optimize the hell out of that. And you do not want to optimize the hell out of the stuff at the bottom. That’s not really driving any traffic, because you’re not getting any value from that. But you’re getting a ton of value from the stuff at the top. Well, and then you also can use those signals, right? So like, what content do people want from me, they’re telling me and the same, not just on my blog, but I’ve a YouTube channel. They’re like, Hey, lady, we don’t want your recipes at all. Only 40 of us watched it. But if you put up a craft room tour, 10s of thousands of people will watch that right. And I don’t want to listen to their signal. I’m still making recipe videos. Right? That’s funny. That’s funny. Okay, and why are you not listening to their signal? Because sponsors want me to make recipes. So if they’re gonna keep paying me money, and and you know what I’ve thought about taking those recipe videos, and slowly moving them over to a recipe only channel, which I have enough content that I could probably do that for a new video every week for two years, and not run out of anything. And seeing if it performs better, because, again, niching it down, they don’t understand what Smart Fun DIY is about on YouTube, because it’s all over the place. It’s so interesting, how much of your time are you splitting between Smart Fun, DIY, and then also your consulting/social media management company. So I’m first Smart Fun DIY, if I have a sponsored post and probably spending like maybe 10 hours on the the blog a month. And if I don’t have any sponsored posts that month, usually I do have one. But if I don’t have any, I’m literally working on it, like three hours, maybe four hours. I do have a VA, she does a lot of submission stuff. For me, really, what I’m focused on this year with that site isn’t so much making new content, but really dialing in on my SEO and, you know, making those those fresh pins and making sure that the content, when they get from Pinterest to my site is valuable. And you know, there’s meat to it, and that it’s going to give them some good information. So I have, you know, there’s I’m always up for trying like crazy stuff. So there are some low quality posts on my site that, you know, I was trying something out and it’s just is not a good experience for people when they get there. So I’m, I’m really working on fixing that stuff. But Smart Fun DIY, literally is a part time gig compared to what I’m doing at Smart Creative Social. So I’ve got two courses there, and a membership. I have corporate clients where I do strategy for. I do have one client I’m still doing management for, but that is a service I phased out. So I only do strategy consulting, because I’m not here enough to do management, you know, management, you need someone that’s available 24/7 or has staff available 24/7, you know. So they can email you on Friday, have a holiday weekend and be like, I need these 50 pins up now. And you can do it and I don’t think that lifestyle was super fun. And I know people that like love it. It was super fun for the years that I did it. But I’m like I’m retiring from management. Because I feel like I can’t do that service well, and there’s a lot of people who can, but what I do well, is strategy. And so I also have some coaching clients. I have group coaching and that kind of thing, that I do where it’s not just social media. I mean, there’s so much stuff that we know these interlocking pieces, and that’s more what I do in those areas. And that is more than 40 hours a week. Just because I really like it. I have a lot of fun. You know, I’ll be on the phone with clients at night. Or, you know, especially if it’s a coaching situation or doing group calls with my course people. And that part is super duper fun. So I love that. So Jennifer, if people want to reach out to you see what you’re doing. What is the best way to do that? they can go to smartcreativesocial.com. And you can get to everything from there. Or hit me up on Instagram. If you go to Smart Fun DIY on Instagram. Let me say it slower. Smart fun. DIY on Instagram. You can message me anywhere if you find me on Facebook or anywhere you can message me and that Facebook group that you had talked about. I mean, I’m pretty easy to find. I love it. Okay. Well, Jennifer, thank you so much for being on the show. And I hope to run into you at a conference in 2019. Yeah, definitely. And thank you so much for having me on. It’s been so much fun. I totally love dishing about this stuff.